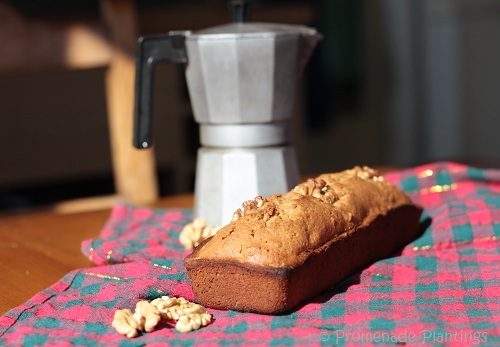 I’ve been on the hunt for a perfect coffee and walnut loaf cake for some considerable time. Most of the recipes I’ve come across are for round cake tins, involve extraneous ingredients and have tons of icing and sugar. What I wanted was a not too sweet cake mix that I could use in a loaf tin – you know the kind perfect for a pound cake – and perfect for slicing up and taking with you onto the slopes. Ok not everyone will be taking a slice of cake with them when they go skiing, but some of us do. And when finally I managed to get the right balance of coffee and walnuts I made another cake to celebrate and to thank the ski shop guys. They work long hard hours, are knowledgable, kind and helpful, generous with their time and infinitely patient. Oh and bloody funny. So a thank you cake was the order of the day, besides I know they all have a sweet tooth (I’ve seen them devour a tin of Quality Street in record time). The recipe I finally worked out was one I already had, a banana cake I make with those ucky-browny-black bananas that have “gone”. The quantities are perfect, simple but good ingredients and very easy to make. Where I’m currently staying doesn’t have a food processor/mixer so it was back to manual cake making. The strong-arm of the baker was put into good use;. a large bowl, wooden spoon and a whisk and I was off. You of course can use your super fast and fancy mixers if you like! Wrap the cake in some clingfilm or tin foil and go to your local ski shop. Say hi and thank you. They’ll be ever so happy!! Note – a quick word about the time it takes to bake this cake, I’m curretnly cooking at altitude so baking in general takes longer, if in doubt err on less time, and keep checking. Thank you Karen, it’s just been baked and the scent is filling the chalet, I’ll have to pack it up soon and drop it off to them! Thanks for this. Coffee cake is a personal favourite! Thank you Julie, I’d been asked by a friend to make a coffee and walnut cake and it took 3 attempts to get it right, what we do for our friends eh?! I wouldn’t be without my coffee maker, so simple and classic and easy! Oh my gosh that sounds good Claire!! mm mm! Another of yours I think i need to try! Do try it…. nom, nom, nom….. This looks lovely Claire. Nothing better than a bit of hand-beating occasionally (great incidental exercise too)! Hope the ski shop boys appreciated your effort – a home-baked cake is surely better than Quality Street! It was a definite work-out beating th ebutter an dsugar by hand, I’d forgotten what work was involved! Damn you for being far away or I’d have said…put the coffee on Claire, I’m on my way! When are you back? next week – I’ll put the coffee on ….. or walk along the beach to Bexhill ……..
No bananas….. I take it you are not a fan Celia ! Seeing as you are so kindly volunteering to taste test in the garden, would you let me know if it works 🙂 …..
Hi Betsy, lovely to see you and thank you! Just finding lots of comments I’ve missed ! It’s so easy (up your street me thinks) that whether there is snow on the ground or not it works! This looks really yummy! Thank you for sharing with us. What a scrumptious Coffee Cake! Simple is always better! The combination of walnuts, butter and coffee is so enticing! That does look rather good! I could use a slice of this with some coffee or tea –yum! Lovely recipe, thanks for posting. This one for me to try out .. mad about walnuts .. fantastic gallery you done .. of your baking and that does make it any easier. So on file we go … and have a fantastic weekend. Thank you – now I’ve made it a few times it’s pretty easy to throw together. You might like icing or frosting on it but for me it was sweet enough – wishing you a great weekend too! NO … ICING!! Hate it … like my cakes naked .. or covered in loads of cream. Will come back with the verdict post. Looks good and coffee black of course. Absolutely Carl, strong hot espresso style coffee for me ! Hi, I’ve been looking for a coffee loaf recipe instead of the round version and this fits the bill beautifully. Can I just confirm it’s a 1lb loaf tin rather than a 2lb? I never heard of a coffee walnut cake that actually calls for coffee in the ingredients! Funny though, before I read your post, I began preparing a bread for my next New Food Friday next month that has coffee in it. It also has some chocolate in it. It’s very delicious. Make sure you tune in for the recipe! I will consider adding coffee to some of my other non-coffee coffee cakes! Hi Marcella, well I’m happy to be the first to introduce coffee to a coffee and walnut cake!!! I was given a wonderful bread on Christmas Day with coffee and chocolate in it – delicious. wishing you happy baking! This looks so good–I wanted to share it with my readers. (I’ve posted your picture–with attribution and as a link to here). This is one I’ll be baking soon. Just had a piece of the cake–it’s wonderful. I did substitute pecans for the nuts since English walnuts taste bitter to me even when really fresh. Perfect coffee-nut balance (even with the change in nuts). Want to try it with black walnuts. That’s great, I’m so pleased you like dthe cake. I don’t think I’ve ever tried black walnuts so I’m going to have to find out about those. Thanks for letting me know and I hope you have a great week! What a great sounding way to start the day. I love sweets but not anything in the morning, especially anything that’s sticky sweet. How was the skiing?